Look for salmon that smells fresh like the ocean with clear eyes, clean gills, and moist scales. Remove packaging, rinse fish under cold water, and pat dry with paper towels. Refrigerate covered with crushed ice and cling wrap for up to two days. The secret to fantastic salmon is to not overcook it. Salmon is done when its flesh becomes opaque but is still moist on the inside. 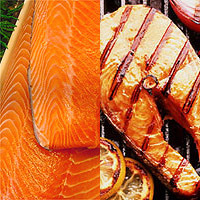 Place seasoned or marinated salmon on a well-greased broiler pan and broil 4 to 5 inches (10 to 12.5 cm) from heat.